news Embattled airline Qantas has flagged plans to cut $200 million out of its technology budget over the next three years and undertake reviews of its major technology supplier contracts, as part of a company-wide cost-cutting initiative that will see a total 5,000 staff leave the company and some $2 billion in total costs cut. When it comes to its technology operations, Qantas might well be described as having been in a continuous state of upheaval for much of the past half-decade, with a continual cost-cutting program having been in place over that time and half a dozen chief information officers having come to lead its IT operation for a brief time, before quickly departing. In mid-2009, the organisation’s then-executive manager of corporate services and technology David Hall told a business lunch in Sydney that the airline could cut its IT costs by $100 million over the succeeding year. Steps taken since that time include a major outsourcing initiative which saw some 200 Qantas IT staff offered positions at IBM; its desktop services contract switched from Telstra to Fujitsu and a new application support deal inked with Perth-based IT services group ASG. 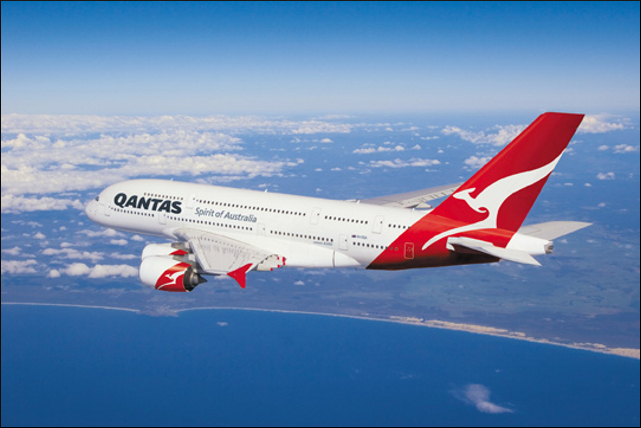 Qantas has also taken other major steps such as deploying Microsoft’s cost-effective Office 365 suite, replacing corporate BlackBerrys with Apple iPhones, implementing Bring Your Own Device programs and shifting off IBM’s Lotus Notes/Domino platform. Subsidiary Jetstar too, has been cutting IT costs, handing an outsourcing contract to Mahindra Satyam in September 2012, shifting most staff onto Google Apps and shifting away from desktop phones for its staff. The organisation’s chief information officer Stephen Tame has tried to run its technology operation on a ‘light’ basis, trying to avoid investing in heavy IT infrastructure. However, the steps have appeared to have only a limited effect on the airline’s IT spending, and Qantas is still struggling with a legacy application portfolio. In December last year, for example, it was reported by the Sydney Morning Herald newspaper that the airline had abandoned a project to replace a 26-year-old IT system that supported some 10 million Qantas frequent flyer members, because the airline couldn’t afford the $40 million it would cost to upgrade the system. In addition, over that time Qantas’ IT management has been in a constant state of flux. Its current chief information officer, Luc Hennekens, has only been in the role for a few months, after previous CIO Paul Jones as promoted in September that year. Other senior executives to have held top IT roles at Qantas over the past half-decade include Hall, former NSW Education Department CIO Stephen Wilson, group executive of strategy and technology Jayne Hrdlicka, CIO Jamila Gordon, and others. Several of the executives had only short-lived stints at Qantas before leaving the business for greener pastures. As part of a high-profile and controversial financial results session this morning, Qantas revealed that the chaos in its IT division was set to continue, with some $200 million worth of cost savings needing to be found by its IT division over the next three years, as part of an overall $2 billion cost savings drive to keep the airline afloat. Programs of work under that cost-savings program include supply chain transformation and a terminal improvement program, application rationalisation, and the creation of next-generation check-in facilities. Qantas will re-negotiate commercial contracts across its business and cut its IT support and infrastructure costs, as well as taking a stricter approach to vendor management. In addition, it will cut some 5,000 staff out of its business over the next three years, including 4,000 over the next year, with the company’s technology division being specifically flagged as an area where cuts need to occur. I suspect it has long been obvious to Qantas’ IT department that IT workers at the company are not precisely valued members of the business; Qantas has been doing everything it can to take costs out of its IT area over the past half-decade. I really have no idea how it is going to find an extra $200 million in costs, but I’m sure it will manage somehow. To me, this kind of massive cost-cutting really bites into the credibility of the airline. If I could avoid it, from here, I would not be flying Qantas. I don’t like seeing cost-cutting of this magnitude in any business, but when we’re talking about airlines, where safety is critical, and we’re talking about IT, which plays a critical role in ensuring safety at airlines, I start to get nervous. Perhaps that’s a bit of an extremist statement to make, but what are we supposed to think when Qantas flags plans to chop another $200 million out of an already thin IT budget, and when its IT management structure appears to change every year or so? It doesn’t precisely inspire confidence. Why don’t they just fire the CEO/Board and get some real people to run this ship? Joycie’s job is almost done, once he kills Qantas, he’ll be 3 for 3. No doubt he’ll be getting a nice juicy bonus for his excellent work this year! hmmm I suspect that the commenters here haven’t walked the halls of Qantas before, it is comfortably the most bloated and dysfunctional organisation I have laid eyes upon. Joyce might be slashing and burning, however I quite frankly don’t see a respectable alternative. Gosh, sounds a lot like Telstra, although without the monopoly control. While other airlines have embraced new technologies to improve performance and change their operational model Qantas stuck to older technologies. Engaged with Qantas as a consultant and there never seemed to a ‘corporate’ view but more a collection of multiple silos and siloed systems. Not sure where they are going to find $200m as a number of the current systems are core to the operation. That also sounds like Telstra. It does. Done work in Telstra as well and they are similar. The issue has been that up until fairly recently none of these organisations had a proper view of their ICT. Given this they would make tactical blunders. An example is setting up outsourcing contracts which happens as management is obsessed with ‘cost’. The blow back from this is that body shops have every incentive to create useless projects that requires code. One client had a need for new capability so the body shop proposed a project to hard code this using an inappropriate technology over many months costing a lot of money – but the labour is cheap. The required capability could have been configured out of the box using an alternative technology in a month but no need for body shop coders to support the new capability. Result is no innovation and IT gets less and less effective as costs rise. With respect to planes and not going 777 and the like, those decisions were pre-joyce. Such is the lag in timeframes for these enterprises. Joyce I think initiated the A380s and the Dreamliner purchases which , on the face of it, could have been real winners. But AirBus and Boeing delayed delivery schedules blew that strategy away. In regards to their IT – well need I remind you of Virgin’s checked history on that front – and they WERE using the latest and greatest. Perhaps we have just segued back to to the Delimiter’s other article which, amonst other things, questions how good we do IT in Australia (http://delimiter.com.au/2014/02/25/vic-govt-opens-offshoring-door/). Surely money spent on IT should, nay, must be expected to, save money elsewhere. Other wise that money should not be spent. We were about to fly OS on Qantas later this year, but a travel agent suggested a better routing (and price). I am now telling those who will listen there is still a role for travel agents. After these disclosures about Qantas IT, I have upped the volume on my ramblings. Where was this announced? I can’t find it in the press release, asx announcement or Joyce’s statement. Just looking for the source if anyone can direct me please? Renai you are being a little bit of an ignorant extremist shock jock about the business facing side of IT affecting Qantas’s air safety. Pilot training, aircraft maintenance and safe operations is what helps keep you safe in the air, not the ticketing and frequent flyer databases systems. I’m sure any safety issues were to arise form any of cuts we’ll see the pilots union up in arms. What’s not that simple? Generally the systems that look after the aircraft are not owned by Qantas maintenance teams. New generations of aircraft have all the data about the health of the plane stored by the planes manufacturer and engine manufacturer. This day and age the Boeings of this world can monitor a planes health in real-time and get parts to the customer when they are needed. There is less burden on the customer now to do these things themselves. Please elaborate on “It’s not that simple”, because otherwise I’m just going to assume you’re another one of those nervous flyers that panics about planes falling out of the sky and are still at wonders with how all those IT systems and buttons in the cockpit keep the plane in the air. I would be wary about saying there are no safety consequences. Crew scheduling, for example, is very complex and also very important. It ensures crew have the mandated rest between flights, and has to take account of the bidding process where crew select their flights according to their seniority, the expected duration of flights and rolling totals of duty time. Also, while engine and air frame data are monitored by manufacturers, decisions about scheduling maintenance are made by Qantas, and they are based on lots of different information. Qantas systems used to be developed by people who were intimately familiar with Qantas and airline operations, from the programmers to the managers. If you start to lose that application expertise, you create scenarios where tiny details don’t get noticed. Hopefully nothing like that is happening. Tony I think this is why Qantas really want to push to remove aging aircraft (notably the 747-4). Because up until now they have needed these systems in place. This is why maintenance is being pushed off shore. Large maintenance operations are no longer privately operated by airlines as it’s a costly to operate, it’s now simply part of a globalisation of aircraft maintenance and it’s made much simpler with these newer generation aircraft. So from an IT perspective there will be savings coming into place from the reduction of complicated legacy maintenance systems.